1. The EV3 Engineering Challenge: Robo-Dragster PPT. This lesson gives students their first look at differences between Science and Engineering and lays out their first Engineering Challenge. The goal of each Engineering challenge is to combine the skills students have recently learned in individual lessons into one complex open-ended design challenge. Walk student through the EV3 Engineering Challenge: Robo-Dragster PPT. This slide compares the Scientific Method (which most students have been exposed to) with the Engineering Process (which most students have not seen). The final step is commercialization, where the product is made available to, and marketed to, customers. Customer feedback gathered for product improvement. Encourage students to find the optimal gear ratio, minimize friction, and build a rigid/balanced structure. Provide students copies of the Color-Activated Robo-Dragster Task Assignment Sheet. Have students document the steps of the Engineering Process (restate challenge in their own words, identify related web sites, etc.) that they use in developing their dragster. This Engineering Process Log_hardcopy Word file may be used to document these steps on paper and this Engineering Process Log_electronic Word file may be used for computer-based documentation. Have students share their designs with the class. Conduct a double-elimination drag racing tournament (so each team races at least twice). This site may be used to create an on-line race bracket with Challonge.com, or this one for Word format hardcopy brackets. This challenge is part of the STEM Robotics Invitational competition and this link provides detailed specifications and logic tics on running such a competition. 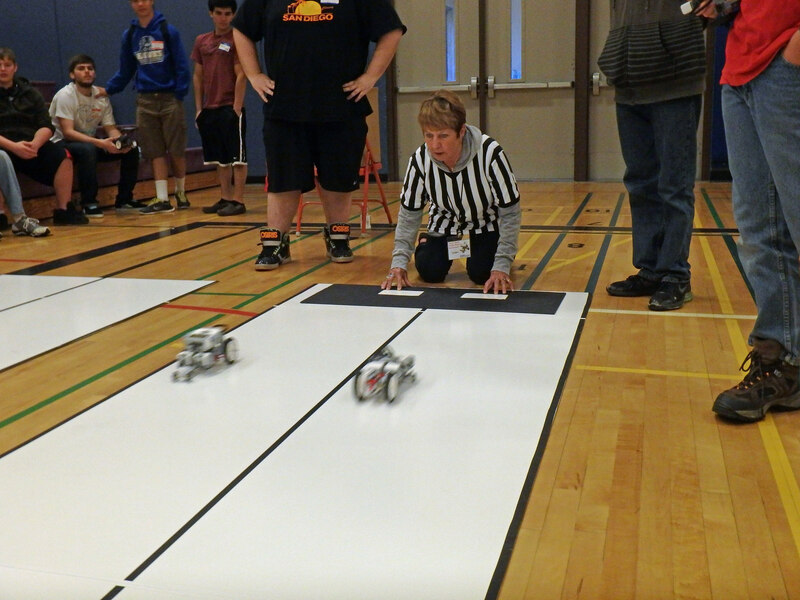 Images from a Color-Activated Robo-Dragster competition are attached below.